After what has felt like months of baseball purgatory, the White Sox are suddenly a font of activity. Despite the rain, Michael Kopech’s first two major league innings were plenty entertaining. On top of Collin’s salient observations, we learned Kopech boasts elite spin rate to pair with his elite velocity. Then, right before Carlos Rodon went out and threw another quality start, the White Sox made a trade and a few other roster moves. First the bad news: Jose Abreu is on the DL with an abdomen/groin surgery and early projections have him out until mid-September or so. Given how many plate appearances they may need to devote to sorting through options like Nicky Delmonico, Daniel Palka, and Matt Davidson — not to mention, hopefully, Eloy Jimenez — perhaps we have seen the last of Jose Abreu for 2018. The White Sox also made a trade! They sent Luis Avilan and his unremarkable left-handed competence to Philadelphia in exchange for Felix Paulino. Paulino is a slightly undersized right-handed relief prospect who has spent his age-23 season finally pitching his way out of High-A and has had a rough go of it in his first look at Double-A. Paulino sits in a 90-95 mph band on his fastball and features both a slider and a cutter but he hasn’t missed as many bats as you’d hope for a slightly older pure reliever. Presumably the White Sox picked him because they saw something, as although moving Avilan (who is in his final arbitration year for 2019) clears a 40-man spot, Paulino will need to be added this winter to avoid being claimed in the Rule 5 draft. He has this in common with Caleb Frare and Kodi Medeiros. 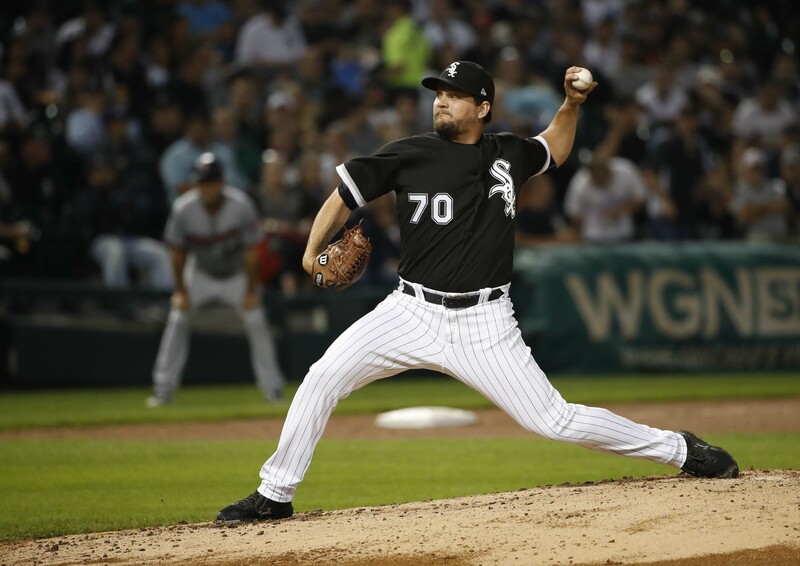 To replace Jose Abreu on the major league roster, the White Sox called up Jose Rondon. For all that Rondon has whatever the opposite of Kopech’s hype is, he’s 24, can legitimately play shortstop, and has suddenly shown a good amount of power across Triple-A and the majors this year. That’s certainly a player who could use another decent run of major league time before the offseason. Last, to replace Avilan in the Chicago bullpen, they called up Ryan Burr. Acquired for IFA money from Arizona, Burr has breezed through the minors without much difficulty. Listed at 6-foot-4, 225 lbs., Burr is physically imposing, although his velocity is more good than great. The right-handed reliever was only in Charlotte for a few weeks, but is certainly ready for a major league look — he’s also due to be added to the 40-man this winter. Inevitably, for reasons both silly and legitimate, Burr getting called up ahead of Ian Hamilton (Burr. Hamilton. Everyone will point this out whenever they can) was a little surprising from a baseball perspective. Hamilton scrapes triple digits and has been annihilating all comers with his heat and low-90s slider, and even made it to Charlotte before Burr did. However, Hamilton doesn’t have to be on the 40-man yet, so perhaps that vaulted Burr ahead of him for logistical reasons. Regardless, I stand by my position that Hamilton being in Triple-A made/makes even less sense than holding down Kopech and Eloy Jimenez did. Still, Burr is a legitimate prospect as far as relievers go, and I am excited to see if he and Hamilton can form the nucleus of an elite bullpen despite minimal resources committed.